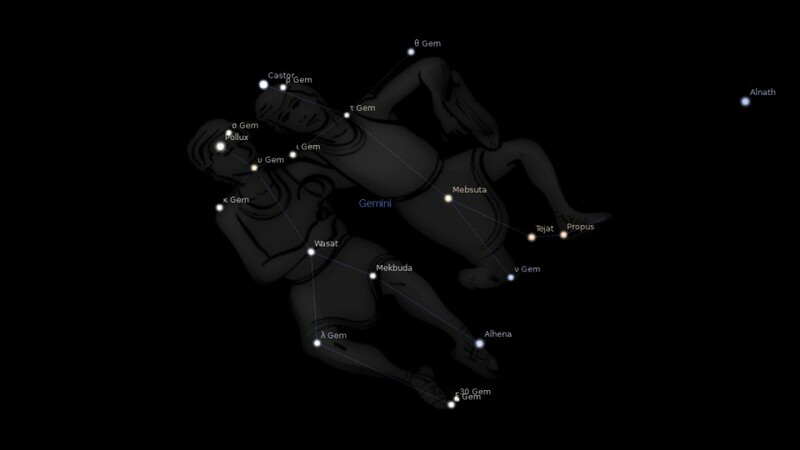 Constellation Gemini the Twins, is an ecliptic constellation laying between the Taurus constellation and the Cancer constellation. The Gemini constellation spans over 20 degrees longitude in the zodiac sign Cancer. The Gemini constellation contains 11 named fixed stars. It is easy to view in the sky because it looks like two matchstick people, with the bright stars Castor and Pollux representing their heads. 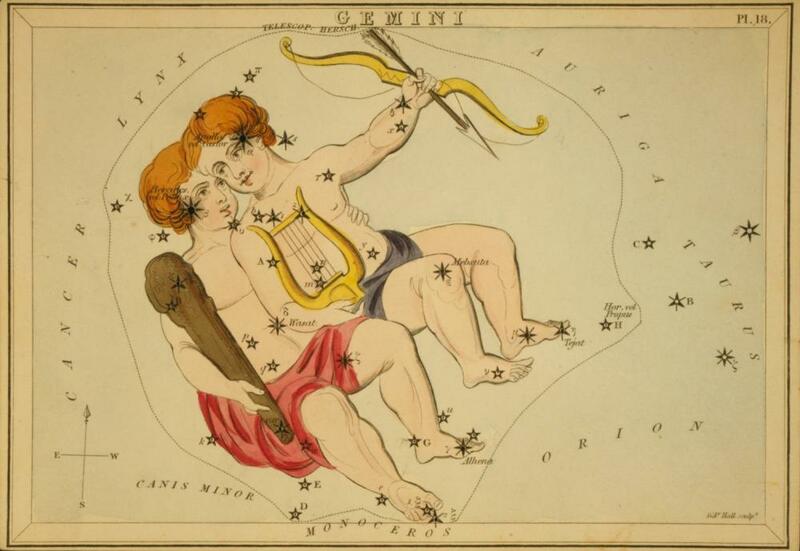 The constellation represents Castor and Pollux, the twin sons of Leda and Jupiter. It has also been suggested that it may represent Apollo and Hercules. Astrologers assigned to this constellation guardianship over human hands, arms, and shoulders; while Albumasar held that it portended intense devotion, genius, largeness of mind, goodness, and liberality. With Virgo it was considered the House of Mercury, and thus the Cylenius tour of Chaucer; and a fortunate sign, ruling over America, Flanders, Lombardy, Sardinia, Armenia, Lower Egypt, Brabant, and Marseilles; and, in ancient days, over the Euxine Sea and the river Ganges. High regard, too, was paid to it in the 17th century as being peculiarly connected with the fortunes of the south of England and the city of London; for the Great Plague and Fire of 1665 and 1666 occurred when this sign was in the ascendant, while the building of London Bridge and other events of importance to the city were begun when special planets were here. But two centuries previously it was thought that whoever happened to be born under the Twins would be “ryght pore and wayke and lyfin mykul tribulacion.” Chinese astrologers asserted that if this constellation were invaded by Mars, war and a poor harvest would ensue. All the pictures of this sign are confused. The Greeks claimed to have invented them, and they called them Apollo and Hercules. The Latins called them Castor and Pollux, and the name of a vessel in which Paul sailed is so called in Acts 28:11. The name in the ancient Denderah Zodiac is Clusus, or Claustrum Hor, which means the place of Him who cometh. It is represented by two human figures walking, or coming. The second appears to be a woman. The other appears to be a man. It is a tailed figure, the tail signifying He cometh. The old Coptic name was Pi-Mahi, the united, as in brotherhood. Not necessarily united by being born at the same time, but united in one fellowship or brotherhood. The Hebrew name is Thaumim, which means united. The root is used in Exodus 26:24 “They (the two boards) shall be coupled together beneath.” In the margin we read, “Heb. twinned” (RV double). The Arabic Al Tauman means the same. The more ancient star-names help us to see through all these and many other myths, and to discern Him of whom they testify; even Him in His twofold nature–God and Man–and His twofold work of suffering and glory, and His twofold coming in humiliation and in triumph. There are 85 stars in the sign: two of the 2nd magnitude, four of the 3rd, six of the 4th, etc. The name of α (in the head of one) is called Apollo, which means ruler, or judge; while β (in the head of the other) is called Hercules, who cometh to labour, or suffer. Another star, γ (in his left foot), is called Al Henah, which means hurt, wounded, or afflicted. Can we have a doubt as to what is the meaning of this double presentation? In Ophiuchus we have the two in one person: the crushed enemy, and the wounded heel. But here the two great primeval truths are presented in two persons; for the two natures were one Person, “God and man in one Christ.” As man, suffering for our redemption; as God, glorified for our complete salvation and final triumph. A star, ε (in the centre of his body), is called Waset, which means set, and tells of Him who “set His face like a flint” to accomplish this mighty Herculean work; and, when the time was come, “steadfastly set His face to go” to complete it. 2. Star Names: Their Lore and Meaning, Richard H. Allen, 1889, p.222-229. 3. Astronomica, Manilius, 1st century AD, book 4, p.119, 235. 4. The Witness of the Stars, E. W. Bullinger, 32. Gemini (the Twins).